« Hillary Clinton: Savior of the Democratic Party? Sen. Barack Obama has gained what could be the equivalent of the nomination, but at the high cost of dragging Hillary Clinton with him. Though she is not an outright Obama-nay-sayer anymore, she is still very much a part of this race and it is to her that a lot of attention is still focused. Not that it’s a bad thing. The Obama-Clinton-2008-knock-down-drag-out-fight has registered thousands of new Democrats and has stirred up so much favorability for party this year that pundits are now predicting Dems to shatter records for unseating Congressional GOP incumbents. I’m still not sold on that latter point, but no one can deny the anti-Republican rhetoric that even some of the most conservative folks in America are using these days. It’s not a good time be in any party other than the one with a gentleman named Barack Obama at it’s helm. And, just so there’s no confusion, I’m prepared to say that he is comfortably in control for until Election Day – though I doubt that I’m going out on much of a limb here. However, I am in the minority when I say that there will still be a role for Hillary Clinton in this new administration, and one that I believe can still involve her being called the first Madame Vice President. If we’re going to talk about people who most deserve the Vice Presidency, no one should discount her from the list. She’s made the only electoral gains in states that Barack Obama must carry in the General Election and is the most prominent Democrat on everyone’s mind right now. She can also raise money by the boatload, her husband is a peerless force both inside and outside the party and she has had over a year in which she has softened her image in the eyes of the American public. That being said, there is a general rule in politics that all presidential nominees follow: choose a running mate that cannot hurt you. He/she doesn’t have to help you, they just can’t hurt you. This is the consideration that all potential Vice Presidential candidates must receive and the metric by which all presidential candidates must use to justify their pick. If they hope to win, of course. I honestly don’t see how Hillary Clinton, fighting on the undercard, has the potential to seriously hurt Obama’s chances. Given all that she has proven in this race, she’s more of an asset to him than any other person out there. The bottom line is that if there is a for a history making ticket, it’s right now. Obama would be an absolute fool for not considering her, especially for all that she brings to the table. 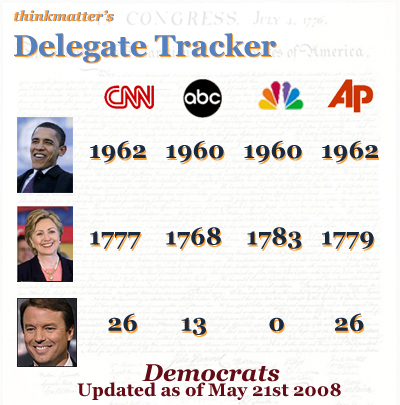 …And now a note about the latest Delegate Tracker. It has been updated to reflect Obama’s majoirty of pledged delgates post-Kentucky/Oregon. However, NBC News has Obama leading in Delegates and Superdelegates and has added Sen. Edwards’ delegates to Obama’s totals. It doesn’t appear that the other news organizations have done this, thus the ‘zero’ under the NBC column. Enjoy.